It seems the end of daylight savings is going to be very challenging for me from now on, at least for the next two months, in getting decent photos for Project 365. And you may be getting a lot of night shots too, which means I really would need to learn how to use and optimise the camera for low-light conditions and start carrying a baby tripod with me everywhere. It’s not the same now compared to earlier in the year, when my movement was not constrained by working hours. My attempt today was tricky at best. It was slightly drizzly and I have forgotten my tripod. 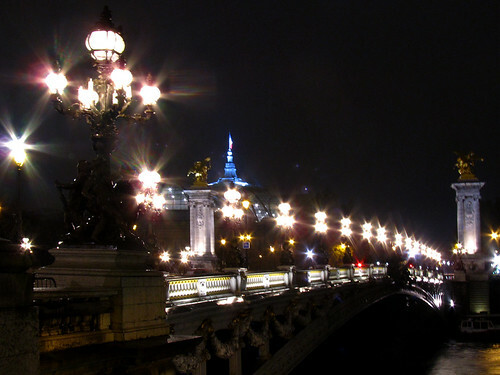 Still, moving on, I took myself towards Invalides and decided it could be nice to try to photograph Pont Alexandre III by night, in the direction of the Grand Palais. As I stood there, the drizzle became progressively heavier but I played on with various settings. I had to pack up when it started to pour. I thought I managed a decent shot but I’m still not particularly happy with this one because it’s not as “crisp” as I’d like it to be. it comes with practice, but it is doable to keep a steady-ish hand. and weekend was lovely, thanks!